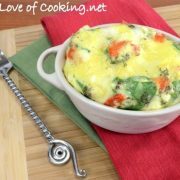 I made this for mini frittata for breakfast recently by using up what I had in the refrigerator. I wanted to keep it healthy yet full of great flavor so the combining feta, roasted red pepper, spinach, and dill together was perfect. This frittata turned out light, fluffy, and super flavorful. A great way to start the day! Preheat the oven to 350 degrees. Coat a mini baking dish with cooking spray. 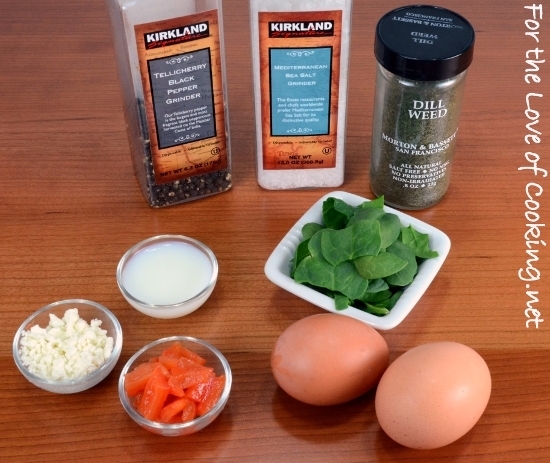 Mix the eggs with the milk until well combined then season with dill, sea salt, and freshly cracked pepper, to taste. 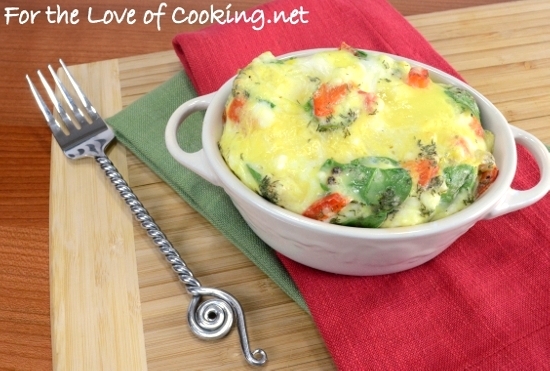 Place a bit of the feta, spinach, and roasted red pepper into the mini baking dish. 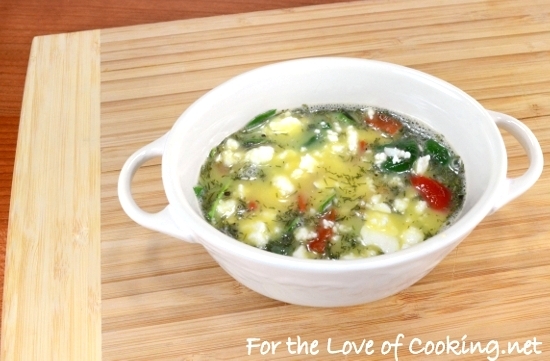 Pour the egg mixture into the baking dish then place the remaining feta, spinach, and roasted red pepper on top. Place into the oven and bake for 25-30 minutes, or until a tester inserted into the center comes out clean. Remove from the oven and serve immediately. Enjoy. Looks wonderful and I love the flavor components in here. Lovely post Pam. Using up lingering stuff in the fridge is always the best! A very nice basic and healthy dish that I could eat any time of day!!! Your frittatas always look so good! 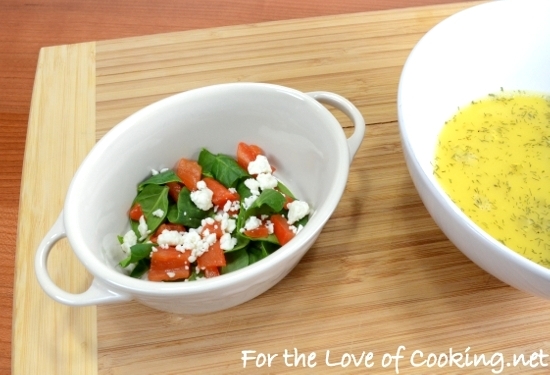 I love using feta and dill together.. a great combination! Pam! This looks wonderful! I just got the prettiest little individual casserole dishes and this would be so tasty in them! Thanks! The way it puffed up made it look especially delicious. I had an omelet this morning that included many of the same ingredients. A hearty egg breakfast is a great way to start the day! this looks so light and delicious, and i love that dish! Feta and dill is a great flavor combo. Would love to have this for breakfast tomorrow! Used this for inspiration for our breakfast this morning and it was great! I used bacon, cheese, spinach, and onions. Can’t wait to try lots of variations on this!! Looks so fresh, simple and delicious. I love eggs and their versatility. Love your combination of yummy ingredients too! I should cook frittata oftener for the breakfast! Looks very delicious. Your frittatas always look awesome! And I love how they always make for such great clean-out-the-fridge meals! It looks simply amazing ! I am on a frittata kick! This looks awesome. I can make this tomorrow for breakfast. Thanks for sharing! I love eating eggs for breakfast. I never have thought of using dill with eggs, sounds good.